Art.sy’s Syrian domain name: Could the company be violating U.S. sanctions? Art.sy, the much-hyped online startup, has a Syrian domain name. Could it be violating U.S. sanctions? 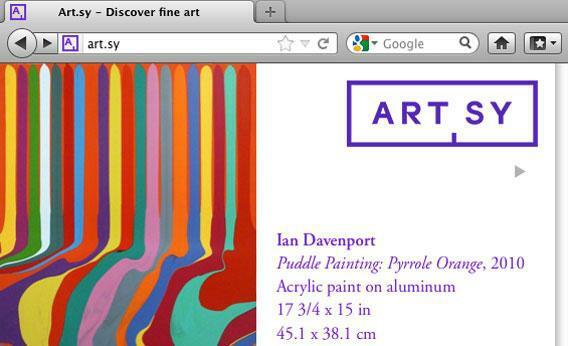 Art.sy is a slick, fine-art website that aims to digitize all of the world’s artworks. It uses artificial intelligence to guess people’s artistic preferences and guide them toward art that is similar and for sale (it earns a commission for every work bought through the site). The company calls itself a “Pandora for the fine art world,” and it has drawn millions of dollars in investment from such high profile ”angel” investors as Wendi Murdoch (wife of Rupert Murdoch), Eric Schmidt (Google’s executive chairman), Jack Dorsey (co-founder of Twitter), Peter Thiel, (co-founder of PayPal), and Dasha Zhukova (gallerist and girlfriend of Russian billionaire Roman Abramovich). It lists among its advisers the world’s pre-eminent art dealer, Larry Gagosian. However, none of these boldface names appear to have asked how the company came upon its own name. Perhaps they should have, because “.sy” is the top-level domain suffix for the Syrian Arab Republic, and .sy domain names can only be purchased and renewed from a Syrian government entity run by a member of President Bashar al-Assad’s regime. By maintaining its undoubtedly cute domain name, Art.sy appears to have been breaking United States sanctions against the war-torn country. According to an email from a company representative, Art.sy’s founder and CEO, the 25-year-old wunderkind Carter Cleveland, bought the .sy domain suffix because it “perfectly captures Art.sy’s mission and accessible character, and is the shortest english spell-able domain that begins with the word ‘art’ making it perfect for sharing on social networks.” However, the need for a catchy brand name that would work well within the online worlds of Facebook and Twitter seems to have blinded Art.sy to an offline world of civil war and international politics. Domain names are delegated by domain name registrars. In 2009, when Cleveland bought the Art.sy domain name, the .sy suffix was managed by the Syrian Telecommunications Establishment (STE), a branch of the Syrian government overseen by Dr. Imad Al-Sabouni, the minister of communication and technology and a member of Assad’s Cabinet. Cleveland used a third party to buy the name Art.sy. According to receipts provided by Art.sy, this was Marcaria.com, a seller of international domain names with headquarters in the British Virgin Islands. Marcaria uses a network of law firms spread across the world to buy up names from local domain name registrars. A Marcaria representative told me that to buy a .sy domain name, Art.sy would have had to sign over power of attorney to Marcaria’s legal proxy in Syria—the Karawani Law Firm of Damascus—who would have then sent the relevant funds to the STE. In early 2011, authority for Syrian domain name subscriptions was taken over by the National Agency for Network Services (NANS), another Syrian government entity, which directed that all registration and renewal payments be made to an account at the Commercial Bank of Syria. Art.sy thought the timing of its purchase made it immune to these rulings—a position the company still maintains. They had renewed their domain name for two years through Marcaria for the sum of $800 in April 2011, well before sanctions were in place. However, NANS itself does not offer domain renewal for longer than one year at a time. To renew a domain name ending in .sy, a yearly subscription has to be paid. Although Art.sy thought they had renewed for two years, the NANS policy suggests that Marcaria was holding Art.sy’s money and paying the Karawani Law Firm (which was in turn paying NANS) on an annual basis. With annual subscription fees being paid to NANS through the Commercial Bank of Syria, Art.sy appears to have been, quite by accident, breaking both the OFAC ruling and the executive order. The Treasury Department issues specific licenses to U.S. companies that want to deal with countries under sanctions on a case-by-case basis. Art.sy does not claim to have been issued one. Syria has been on the State Department’s list of state sponsors of terrorism since 1979. We have made no payment for our domain name rights since before the relevant sanction’s effective date. We made a payment to Marcaria in April, 2011 with no awareness of, and accordingly no control over, the payment collection practices of NANS, or any transactions involving Marcaria and NANS. The problem comes up on annual renewal. The sanctions that are in play here have been longer than a year [since Art.sy last renewed its domain name in April 2011], so that’s going to be trouble for everybody. There’s a general provision that would prohibit any financial transactions with the Syrian government. And that’s going to be in both OFAC rules and the executive order. The selling of Internet domain names is big business. In 2000, Tuvalu, a Polynesian island nation, negotiated a contract leasing its Internet domain name “.tv” for $50 million, doubling the island’s GDP. A similar storm erupted in 2011 when the Libyan Internet domain suffix “.ly”—which hosted, among other sites, the popular URL shortening service bit.ly—was revealed to be issued by the General Post and Telecommunications Company, a Libyan state firm whose chairman was Muammar Qaddafi’s eldest son. (According to Burns, the Treasury Department issued licenses to some U.S. businesses during that period, allowing them to deal with third parties in order to maintain their .ly domain names.) Today, Libya is no longer under U.S. sanctions, and in any case bit.ly seems to have learned a lesson—it now redirects visitors to bitly.com. When asked whether Art.sy would consider changing their name—since continued renewal of it would violate sanctions—Art.sy ignored the question and stated simply that “as a startup with limited resources, we need to focus on building our company.” None of the site’s high-profile financial backers or advisers responded to inquiries about their possible involvement in the breaking of sanctions, with the exception of Thiel, whose spokesman merely confirmed that Thiel was “a passive investor” in the website. Requests to speak to Cleveland were referred to the company’s representative. E.O. 13582 generally prohibits U.S. persons from engaging in transactions with the entire Syrian government or its entities whether they are individually listed on the SDN list or not and also prohibits the exportation of services to Syria from the United States or by U.S. persons. Penalties for each violation could include OFAC civil penalties of up to $250k or twice the value of the transaction. DOJ may also pursue criminal penalties, up to $1m and 20 years in prison. Art.sy is no doubt unfortunate to be in this situation. It presumably didn’t intend to break sanctions and seemingly didn’t even know that it might be violating sanctions until Slate approached it. Nevertheless, its use of a Syrian domain name has gone from being in questionable taste to being of questionable legality. Where this leaves Art.sy and its investors is uncertain. But what it does demonstrate is the shocking insularity of the dot.com and fine-art worlds. In seeking a cute and easily tweetable brand name, Art.sy ended up owning a bloodstained one.